Marc Andreessen Answers the Tech Valuation Question | Bloomberg.com: "many investors don't grasp what's changed ..."
Stock returns tend to be driven by a handful of big winners; for venture investors, it’s even more lopsided. Venture-capital funds typically have a 50 percent failure rate -- half of the investments lose money, with half of those being total losses. The third quartile breaks even, or returns two or three times their money over five to 10 years. The real action is in their top quartile, which can generate return on investments of anywhere from three- to 1,000-fold. The attacks occurred on 195,475 unique domain names. This is the most we have recorded in any year since we began these reports in 2007. 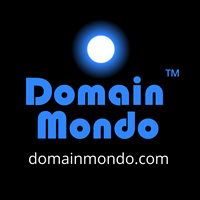 The number of domain names in the world grew from 287.3 million in December 2014 to 329.3 million in December 2016. The Anti-Phishing Working Group (APWG)is a non-profit industry association focused on eliminating the identity theft and fraud that result from the growing problem of phishing and email spoofing. The organization provides a forum to discuss phishing issues, define the scope of the phishing problem in terms of hard and soft costs, and share information and best practices for eliminating the problem. June 27, 2017: European Competition Commissioner Margrethe Vestager discusses the EU’s antitrust case against Google and compliance from the company. She speaks with Bloomberg.com's David Westin on "Bloomberg Daybreak: Americas." Google has to apply the same processes and methods to position and display rival comparison shopping services in Google's search results pages as it gives to its own comparison shopping service. "It is Google's sole responsibility to ensure compliance and it is for Google to explain how it intends to do so. Regardless of which option Google chooses, the Commission will monitor Google's compliance closely and Google is under an obligation to keep the Commission informed of its actions (initially within 60 days of the Decision, followed by periodic reports). "If Google fails to comply with the Commission's Decision, it would be liable for non-compliance payments of up to 5% of the average daily worldwide turnover of Alphabet, Google's parent company. The Commission would have to determine such non-compliance in a separate decision, with any payment backdated to when the non-compliance started. 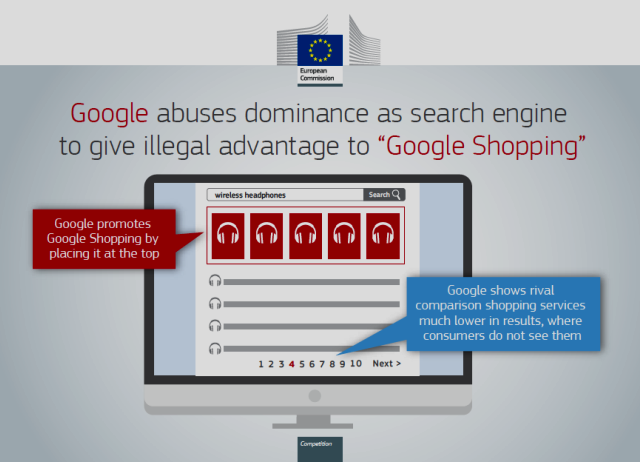 "Finally, Google is also liable to face civil actions for damages that can be brought before the courts of the Member States by any person or business affected by its anti-competitive behaviour. The new EU Antitrust Damages Directive makes it easier for victims of anti-competitive practices to obtain damages. 2) AdSense, where the Commission is concerned that Google has reduced choice by preventing third-party websites from sourcing search ads from Google's competitors. "The Commission also continues to examine Google's treatment in its search results of other specialised Google search services. Today's Decision is a precedent which establishes the framework for the assessment of the legality of this type of conduct. At the same time, it does not replace the need for a case-specific analysis to account for the specific characteristics of each market. Today's Decision is addressed to Google Inc. and Alphabet Inc., Google's parent company. Shares of Alphabet Inc. on the NASDAQ: GOOGL and GOOG, traded lower on Tuesday, June 27, 2017. Loser: All of us addicted to the numerous screens in our lives. Guest Adam Alter, NYU marketing professor and author of Irresistible: The Rise of Addictive Technology and the Business of Keeping Us Hooked, discusses what makes our devices so hard to put down. Editor's Note: Phone addiction is a problem: "Phubbing" (a portmanteau of ‘phone’ and ‘snubbing’) occurs when conversation is interrupted by attention being given to a smartphone rather than the person you’re with. See What is phubbing and could it hurting your relationship? | whimn.com.au. Interview With Daron Acemoglu: Masters in Business (Audio) by Bloomberg View: Bloomberg View columnist Barry Ritholtz interviews Daron Acemoglu, Elizabeth and James Killian Professor of Economics at MIT. He is the recipient of several awards, including the 2005 John Bates Clark Medal. He is the co-author of "Why Nations Fail: The Origins of Power, Prosperity and Poverty" and among the most cited economists in the world. Video above published March 23, 2012, by the Massachusetts Institute of Technology (MIT). All the difference in the world | MIT.edu: Economists Daron Acemoglu of MIT and James Robinson of Harvard University have another answer: Politics makes the difference. Countries that have what they call “inclusive” political governments — those extending political and property rights as broadly as possible, while enforcing laws and providing some public infrastructure — experience the greatest growth over the long run. By contrast, Acemoglu and Robinson assert, countries with “extractive” political systems — in which power is wielded by a small elite — either fail to grow broadly or wither away after short bursts of economic expansion. “You need political equality to underpin economic prosperity,” says Acemoglu, the Elizabeth and James Killian Professor of Economics at MIT. Features • 1) ICANN59 Policy Forum, 2) Other ICANN news - Holding ICANN Accountable, 3) Names, Domains & Trademarks, 4) ICYMI, 5) Most Popular. Note the Competition, Consumer Trust and Consumer Choice Review Team (CCT Review Team or CCTRT) meeting in Johannesburg on 24-25 June. More info here. WS2 CCWG ACCT Face to Face Plenary Meetiing, Sunday, June 25, 08:30 - 17:30. 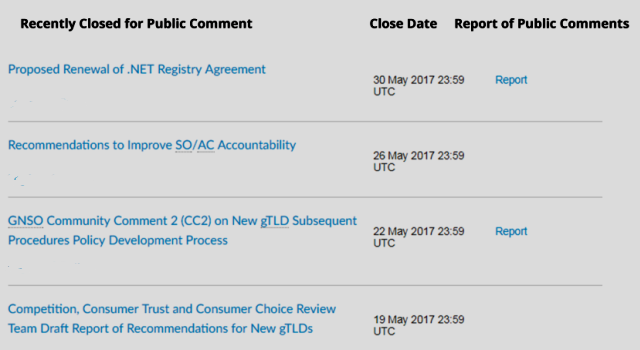 ICANN59 Johannesburg: GAC Session on the CCT Review Update: The GAC will discuss the CCT Review Report on Monday June 26, 2017 14:00 - 14:30. EU General Data Protection Regulation (GDPR) ICANN59 Johannesburg: GDPR and its potential impact: looking for practical solutions Tuesday, June 27, 15:15 - 16:45. What is taking ICANN CFO Xavier Calvez so long (see embed below) to respond to Domain Mondo's inquiry of May 28, 2017? 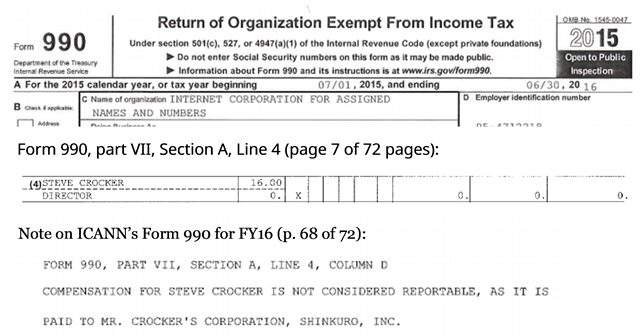 Perhaps "hiding" compensation of the Chairman of the Board of Directors of ICANN, a 501(c)(3) non-profit California corporation, is something that neither the IRS nor the California Attorney General condones? However, it may speak "volumes" of how ICANN is really run and what ICANN leadership really thinks of the global public interest, accountability, and transparency. As I have said before, with ICANN (like dead fish), the rot starts at the top. "Top level domain (TLD) zone files are vital resources for performing Domain Name System (DNS) research, security research, and anti-abuse operations. The stated goals of the Centralized Zone Data Service (CZDS) program were standardization and easy, reliable operations for participants who have a requirement to access these zone files ... after three years of operation, community members have documented problems where the CZDS does not deliver on these objectives. Policy and process difficulties prevent subscribers from gaining and then maintaining reliable access to zone files. These problems affect the ability of subscribers to perform research and security functions that benefit the public interest. Furthermore, certain registry metrics related to zone files and WHOIS queries are being reported in an inconsistent fashion. This advisory details these problems and recommends improvements." The above "recommendations" are all based upon minimal common sense, which begs the question: where is ICANN's bloated and overpaid management? Asleep or just incompetent? c. WS2 Dashboard 23Jun17 final.pdf "this version was rushed for ICANN 59, statistics cover 6-01 thru 6-23 only, not the full month." • Update: Systemic Copyright Alternative Dispute Resolution (SCADR) Policy | pir.org June 20, 2017: "... the feedback we have received to date indicates that this solution lacks sufficient support from our stakeholders. Accordingly, PIR will not implement the SCADR." • Afnic Study: The Global Domain Name Market in 2016 | afnic.fr: Country code Top-Level Domains (ccTLDs) experienced zero growth in 2016. Overall market growth in 2016 was 7.1%, down from 11.7% in 2015. ICANN's Theorem of Greed + Incompetence = Choice & Innovation has been proven FALSE. • Thinking of Moving Your Website To A New Domain Name? It can (and probably will) take 3 months (or more) for Google Search to pick up all the changes, in the meantime your website will lose traffic, customers, business and $$, no matter what that SEO guru or new gTLD huckster told you--SERoundTable.com. • US Supreme Court (pdf) says in the U.S., a disparaging remark is free speech and can be a registered trademark. See also: SCOTUS Strikes Down Disparaging Trademark Ban | foxrothschild.com. • Questions Mount Over Future Of IP [Intellectual Property] | ip-watch.org. AWS re:Invent 2017 | Amazon Web Services: registration now open for the world's largest global cloud computing conference, 27 Nov - 1 Dec 2017; campus: ARIA, Encore, MGM, Mirage, The LINQ, and The Venetian in Las Vegas, NV (US). Using Texts as Lures, Government Spyware Targets Mexican Journalists and Their Families | NYTimes.com: "Mexico’s most prominent human rights lawyers, journalists and anti-corruption activists have been targeted by advanced spyware sold to the Mexican government on the condition that it be used only to investigate criminals and terrorists." URL Padding: Facebook Mobile Users Hit by Phishing Scam | hackread.com: ‘URL padding’ is a technique used by spammers to hide a malicious address by masquerading it in a legitimate looking domain name and hence tricking users into giving out their credentials. URL padding has been observed by researchers at PhishLabs as being used by a majority of the spammers to target mobile users. Statement on Marawi, Martial Law and internet freedom | DavaoToday.com: "We urge citizens and organizations to be vigilant and jealous of the rights we enjoy, offline or online, against any arrogant overreach by the military and government ... Let’s keep the Philippines’ and the internet free." Silicon Valley’s self-serving myths about online freedom | ft.com: "The promise of an internet under the benign oversight of innovators was never achievable." Globalist Internet Regulation Agenda Suffers Setback in Britain | Breitbart.com: "One silver lining for British libertarians following the U.K. general election, which saw Labour’s hard left leader Jeremy Corbyn come within spitting distance of Downing Street, is that Prime Minister Theresa May’s plans for internet censorship might now be harder to achieve." Help Save Internet Fairness | AmericanLibrariesMagazine.org: "Public comments now open on new FCC net neutrality proposal"
BroadbandBreakfast.com: Panelists at Tech Event Hope that Trump Administration Will Rally to Cause of Global Internet Freedom. Features • 1) Uber ex-CEO Travis Kalanick & Silicon Valley Culture, 2) Ant Financial is an AI company, 3) Cisco Live 2017 Las Vegas Keynote, 4) Amazon Web Services | AWS re:Invent 2017, 5) Google for Jobs, 6) FTC vs DraftKings-Fanduel merger, 7) ICYMI Tech News. Video above published Jun 21, 2017: Bloomberg Profiles looks at the story of Uber's Travis Kalanick and how he went from UCLA dropout to CEO of the world's most valuable technology startup. Video above published Jun 22, 2017: Matt Cohler and Peter Fenton, partners at venture capital firm Benchmark, hand-delivered a letter urging Travis Kalanick’s resignation as Uber's CEO, people familiar with the matter said. Bloomberg's Eric Newcomer reports on "Bloomberg Technology." Uber Technologies Inc. is a US-based technology company headquartered in San Francisco, California, operating in 570 cities globally. It develops, markets and operates the Uber car transportation and food delivery mobile apps. The company is a privately-held VC-backed "unicorn" having raised about $11.56 billion from 16 rounds of venture capital and private equity investors. Uber’s Lesson: Silicon Valley’s Start-Up Machine Needs Fixing | NYTimes.com: "... this was a clear failure of oversight — of investors, boards of directors, partners and anyone else who could have altered Uber’s course and clearly failed to do so. Overlearning the lesson of Steve Jobs’s first fall at Apple — and of founder-led hyper-successes at Google and Facebook — Silicon Valley’s investors created a culture where founders are given carte blanche, their pronouncements and tactics elevated to the level of divine infallibility." --Farhad Manjoo. The Unaffordable Urban Paradise | MIT TechnologyReview.com: "Tech startups helped turn a handful of metro areas into megastars. Now they’re tearing those cities apart." 4) AWS re:Invent 2017 | Amazon Web Services: registration now open for the world's largest global cloud computing conference, 27 Nov - 1 Dec 2017; campus: ARIA, Encore, MGM, Mirage, The LINQ, The Venetian in Las Vegas, NV (US). 6) The FTC, jointly with the Attorneys General in California and the District of Colombia, is attempting to block the DraftKings-Fanduel merger--TechCrunch.com. China's JD.com invested nearly $400 million into fashion startup Farfetch.com.--Recode.net. Top 10 Mistakes in Enterprise Blockchain Projects | gartner.com: "Part of the problem is that the majority of enterprise blockchain projects don’t actually require blockchain technology. In fact, these projects would probably be more successful if they did not utilize blockchain." Media Companies Are Getting Sick of Facebook | Bloomberg.com: "“Facebook is about Facebook,” says Andrew Morse, general manager of CNN’s digital operations." Amazon Welcomes You To The New World Order: Reflections On The Whole Foods Acquisition - Amazon.com, Inc. (NASDAQ:AMZN) | SeekingAlpha.com. "Moby Store, launched by Wheelys, a Stockholm-headquartered crowdfunded startup. Originally focused on making cafés that can be moved from one spot to the next by bike, the company is now testing out a model of a 24-hour store run entirely by technology." --In China, a Store of the Future—No Checkout, No Staff | MIT TechnologyReview.com. Apple's Next iPhone Too Little, Too Late?--SeekingAlpha.com: "Apple revenue growth is stalling, particularly in China. Apple keeps raising iPhone prices to maintain margin ... Expected features of the next iPhone are pretty tame. The iPhone may go the way of Mac computer - a tiny niche in a massive market." Video above published Dec 8, 2015: OpenFin is the Leading Provider of HTML5 Container Technology for the Global Financial Industry. Built on Google Chromium and tailored for financial firms, OpenFin is a powerful HTML5 engine that enables seamless desktop deployment, native experience and application interoperability. The world’s largest financial institutions and trading platforms use OpenFin’s patented technology to deploy applications both in-house and to over 250 buy-side and 40 sell-side customers. Video above published Jun 20, 2017, by Stanford Graduate School of Business: Ehi Binitie, co-founder of Rancard (domain: rancard.com), shares his journey of solving phenomenal problems that many parts of the world never get to see. Rancard Solutions Limited headquarters: Accra, Ghana. See: Stanford Seed | Stanford Graduate School of Business | gsb.stanford.edu: "Seed, the Stanford Institute for Innovation in Developing Economies, is working to end the cycle of global poverty." Stanford Seed East Africa is registered as Stanford University Global LLC - Kenya Branch. Stanford Seed West Africa is registered as Stanford University Global LLC. *Stanford Seed India is registered as Stanford India PLC. LIVE at 2:00pm EDT, June 21, 2017. Presented by NewAmerica.org and InternetAssociation.org. Net Neutrality and the Economy: How the FCC’s Net Neutrality Rules Promote Investment, Create Jobs, and Protect Consumers. The Federal Communications Commission’s 2015 net neutrality rules were a landmark achievement for consumer rights online and the United States economy. Whether it’s large internet companies, up-and-coming digital platforms, or small businesses that rely on online services to reach customers, nearly every company in some way uses the power of the internet. The net neutrality rules, which prohibit broadband companies from blocking, throttling, and creating online “slow lanes,” are crucial for economic development, job creation, and serve as a democratizing force for communication. The FCC’s recent decision to move forward on a proposal to repeal the net neutrality rules brings an urgent need for civil society, consumer advocates, and companies large and small to fight to retain the rules that were secured two years ago. Without the net neutrality rules, a small number of broadband companies would become gatekeepers of the internet economy and control how every American uses the internet. FCC Commissioner Mignon Clyburn will give opening remarks. Panelists include representatives from the business and public interest communities who will discuss the economic benefits that stem from the net neutrality rules. New America’s Open Technology Institute and the Internet Association present this two panel discussion about the importance of net neutrality for consumers and small businesses. Video above published Jun 19, 2017, by WhiteHouse.gov. See Presidential Executive Order on the Establishment of the American Technology Council. See also: White House wants to create new surge of tech startups | FoxBusiness.com: “We will foster a new set of startups focused on [government] tech and be the new global leader in the field, making government more transparent and responsive to citizens’ needs,” said Kushner, who serves as senior advisor to the president and leads the Office of American Innovation. Video above published Apr 17, 2017, by L2inc.com: Scott Galloway speaks at L2’s Amazon Clinic about how Amazon is disrupting retail. Not only has Amazon changed consumer shopping habits, it has changed the relationship between shareholders and investors. Investors are no longer satisfied with steadily growing profits; instead they seek fast growth and strong vision – even at the expense of profitability. See video for insights on the future of brand, Alexa’s effect on households. See also: I’m in Awe of How Fast Brick-and-Mortar Retail is Melting Down | Wolf Street.com and The Global Impact of Amazon's Whole Foods Acquisition (videos) | DomainMondo.com. 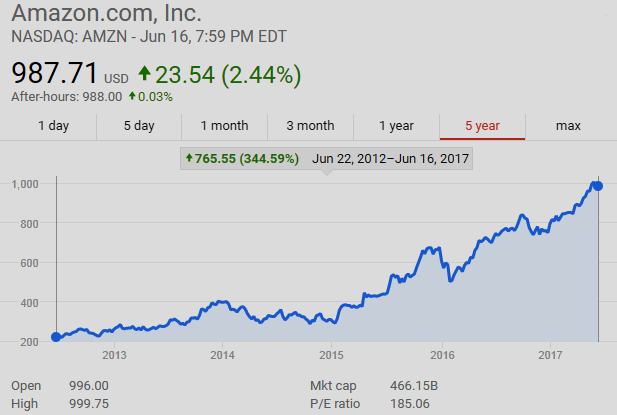 Video above published Jun 16, 2017: Bloomberg.com's Caroline Hyde takes a look at the global impact of Amazon.com, Inc.'s $13.7 billion purchase of Whole Foods Market Inc. (wholefoodsmarket.com). She speaks with Bloomberg's Emily Chang on "Bloomberg Technology." Video above published on Jun 16, 2017: Bob O'Donnell, President of Technalysis Research (technalysisresearch.com), and Bloomberg's Ellen Huet discuss what Amazon.com Inc.'s purchase of Whole Foods Market Inc. means for tech startups. They speak with Bloomberg's Emily Chang on "Bloomberg Technology." Video above published Jun 16, 2017: Scott Mushkin, Wolfe Research (wolferesearch.com) senior retail analyst, discusses Amazon.com's Inc.'s $13.7 billion purchase of Whole Foods Market Inc. He speaks with Bloomberg's Julia Chatterley and Joe Weisenthal on "What'd You Miss?" Video above published Jun 16, 2017: Bruce Berkowitz, founder of Fairholme Capital Management, (fairholmefunds.com) comments on Amazon.com Inc.'s $13.7 billion purchase of Whole Foods Market Inc. during an interview with Bloomberg's Erik Schatzker. Features • 1) .AFRICA: ICANN Motion for Summary Judgment, 2) Other ICANN news: a. Cure for ICANN Dysfunction, b. Realm of the Absurd, c. Who was arrested at ICANN? d. Public Comment Reports: .NET, new gTLDs, e. Fake Profiles at ICANN, f. ICANN Dept of Dysfunction, g. ICANN jurisdiction "coup from the top", h. Holding ICANN Accountable (IRS Form 990), i. ICANN Board Public Session, 3) Names, Domains & Trademarks, 4) ICYMI, 5) Investing: Donuts & Rightside $NAME, Neustar $NSR, 6) Most Popular. “… DCA and Ruby Glen [Donuts affiliate] breached their agreement not to file a lawsuit against ICANN arising out of their [new gTLD] applications, as set forth in the Covenant [Covenant Not to Sue in the Applicant Guidebook]. The district court in Ruby Glen dismissed Ruby Glen’s complaint [re: .WEB] at the Federal Rule of Civil Procedure 12(b)(6) stage because of the Covenant. Likewise, because DCA’s claims all pertain to the “processing and consideration of” a new gTLD [.AFRICA] application, DCA’s lawsuit is barred under the Covenant …”--ICANN's motion for summary judgment, p. 23, set for a hearing on August 9, 2017. "Any Charter that recognizes GoDaddy as a closed brand, rather than a Registrar, has truly ventured into the Realm of the Absurd." --James Bladel, GoDaddy V.P., Global Policy, and Chair of the GNSO Council. [council] FW: [RrSG-Members] GoDaddy Status and Resignation: "I’ve recently been notified that GoDaddy is not eligible to hold office under the current RrSG [ICANN Registrar Stakeholder Group] Charter, due to our having executed Specification 13 for the [new gTLD] .GODADDY Registry Agreement. While Specification 13 is not explicitly listed as a disqualification in our Charter, it contains provisions that are equivalent to Specification 9, which is called out as a disqualification under Section 4.3.6. I was not aware that our adoption of Spec 13 would also encompass Spec 9, and thus make GoDaddy (and by extension, me) ineligible to hold office. We have no immediate plans to launch .GODADDY, and the only active registration currently is NIC.GODADDY, and any Charter that recognizes GoDaddy as a closed brand, rather than a Registrar, has truly ventured into the realm of the Absurd. But rules are rules, so… I’m hereby offering my resignation from the GNSO Council for the remainder of my term (ending at ICANN 60 Abu Dhabi in November). Should the ExCom & Members wish to retain me in office until the conclusion my term, I would be happy to do so on an interim basis, and stand for a special vote, as described under Section 4.3.7. Additionally, GoDaddy will not nominate or run any candidates for office under the existing Charter, and will not cast votes for any pending elections, or on the FY2018 RrSG Budget, or any other votes until our new Charter is adopted." --James Bladel, June 13, 2017. Postscript: "I (Bladel) have resigned my elected office as Councilor, but have been appointed by the Registrar ExCom to continue to serve in an interim basis until a Special Election can be held. On the whole, the net impact of all of this on the Council is….not much. My status changes from “elected” Councilor to “appointed” Councilor for the next few months, but I don’t see that this change necessarily affects the Council, or its work, or our upcoming election calendar." (1) Report of Public Comment Proceeding (pdf) on Proposed Renewal of .NET Registry Agreement: "As a next step, ICANN organization intends to consider the proposed renewal of the .NET Registry Agreement taking into account the comments added to the forum. Following the completion of the public comment process, the proposed renewal of the .NET Registry Agreement will be considered by ICANN's Board of Directors." e. Fighting Fake Profiles on icann.org | ICANN.org: "... To ensure the integrity of content on icann.org, and to mitigate the risks from fake or spam profiles, we have decided that the best short-term solution is to turn off the public aspect of profiles. This change will take effect on 23 June 2017. This temporary fix will afford us the time to work on a better solution, while ridding the site of inappropriate and obscene content. We have already deleted 6,000 of the most egregious and obvious fake profiles." See ICANN Profiles. f. From the ICANN Department of Dysfunction: 09 June 2017 unsigned letter from anonymous "members" of RySG [Registry Stakeholder Group] to Steve Crocker and Göran Marby (pdf) [published 12 June 2017] requesting the ICANN Board set a date certain now (before prerequisite reviews and planning are even near completion) for the "next round" of new gTLDs. i. ICANN Board to Hold Public Session During Johannesburg Workshop | ICANN.org: "The session, Board Review of the FY18 Final Budget, will be held on Friday, 23 June, from 15:15 – 16:45 (13:15 – 14:45 UTC)." More info at link above. Farfetch buys Style.com, forges global partnership with Condé Nast | LATimes.com. Another reason why a .COM domain name is always preferred: "there’s another type of leakage that occurs when you don’t use .com: email. And this is where business can be lost."--DomainNameWire.com. About half of small businesses don't have a website | cnbc.com. DNS changer malware: how to detect it and protect yourself | Comparitech.com. Why the Record Number of Reverse Domain Name Hijacking UDRP Filings in 2016? | circleid.com. #WSIS Forum #ICT4D workshop, Alex Wong, @wef: the poorest 1 billion only has $2.25/month to spend on communication. What would the web be like without Net Neutrality? | OpenMedia.org. EFF and Broad Coalition Call for Day of Action to Defend Net Neutrality | Electronic Frontier Foundation: On July 12, 2017, EFF and hundreds of organizations – including nonprofits, artists, tech companies large and small, libraries, and even ISPs – will be joining together to take action to defend the open Internet. Details to follow, but the goal is simple. Let’s send a strong message to the FCC and Congress: Don’t Mess With the Internet. FCC's Open Internet Docket Explodes | Multichannel.com: "huge wave of comments ... since Friday (June 2), with more than 4.9 million posted, up by about 2 million from Friday afternoon's 2.9 million-plus ..."
Hidden Cobra–North Korea’s DDoS Botnet Infrastructure | US-CERT | us-cert.gov: Alert (TA17-164A) re: North Korea’s DDoS Botnet Infrastructure. Internet Fragmentation Exists, But Not In the Way That You Think | Council on Foreign Relations | cfr.org: "The tension between global cyberspace and the territorial state is the primary factor that drives internet governance and cybersecurity debates. It is time to face that problem directly." Silicon Valley leadership is key in the fight against terror | ft.com by Robert Hannigan, a former director of UK's GCHQ: "There are two separate complaints about the internet: that it facilitates covert communication between terrorists through encrypted messaging, and that it enables the spread of radicalising propaganda by hosting extremist material." Indexing Ethiopia | CyberEthiopia.com: "Ethiopia is one of the least connected countries in the world with an internet penetration rate of only 12 percent, according to 2015 data from the International Telecommunications Union (ITU). FNI reported, “A handful of signal stations service the entire country, resulting in network congestion and frequent disconnection. In a typical small town, individuals often hike to the top of the nearest hill to find a mobile phone signal.”"
Forum on Internet Freedom in Africa (FIFAfrica) 2017 | NGOpulse.org: This year’s edition of the Forum will be held in Johannesburg, South Africa, on 27-29 September. Indian strategy to defame freedom struggle! | KashmirWatch.com: "... The internet is often suspended or restricted in Kashmir to quell civilian protests and anti-India demonstrations, which sometimes turn violent. According to a report by the Software Freedom Law Centre, the internet has been blocked in Kashmir at least 31 times between 2012 and 2016. However, this is for the first time that the authorities have placed a complete ban on social networking sites." Germany's Merkel says digital world needs global rules | Reuters.com. Germany wants the Group of 20 major economies to develop a plan on digital policy at a July summit. Merkel cited an agreement by G20 nations to fight cyber attacks on the global banking system. • Form 8-K EX-99.1: "Rightside and Donuts Announce Definitive Merger Agreement Donuts to Acquire Rightside for $10.60 Per Share in Cash Transaction Valued at Approximately $213 Million ... The transaction ... is currently expected to close during the third quarter of 2017. Following the transaction, Rightside will become a wholly-owned subsidiary of Donuts, a privately-held company, and Rightside’s common shares will no longer be listed on any public market." 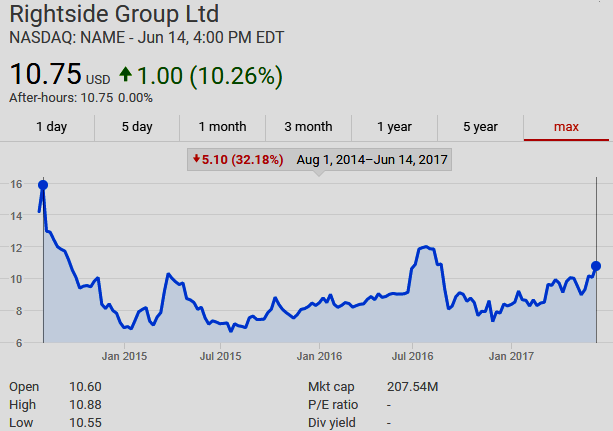 NASDAQ: NAME (June 14, 2017 chart below: note share price: (a) $15.85 August 1, 2014, right after spinoff of Rightside from Demand Media; (b) Closing price $12.09 July 27, 2016; and (c) $10.60 all cash tender offer via Donuts June 13, 2017, shares closed up Wednesday, June 14, 2017. • Neustar (NYSE: NSR) Form 8-K June 12, 2017: "As previously reported, on December 14, 2016, NeuStar, Inc. (“Neustar”) entered into an Agreement and Plan of Merger (the “Merger Agreement”) with Aerial Topco, L.P. (“Parent”) and Aerial Merger Sub, Inc. (“Merger Sub”) ... On June 12, 2017, and in accordance with the terms of the Merger Agreement, Neustar extended the Outside Date from June 14, 2017 to September 14, 2017. On June 12, 2017, Neustar received written notification from the Committee on Foreign Investment in the United States (“CFIUS”) that it will not take action to prevent the transactions contemplated by the Merger Agreement from being consummated. Receipt of the written notification from CFIUS satisfies one of the conditions to the closing of the Merger, which remains subject to the receipt of approval from the Federal Communications Commission and the satisfaction or waiver of other customary closing conditions. Neustar continues to expect the Merger to be completed no later than the extended Outside Date."